Tuesday morning, the Jerusalem students hiked to a monastery in the middle of the desert, called St. George Monastery. This amazing cliff-hanging monastery, one of the world’s oldest and definitely one of the most inspiring churches in the Holy Land. 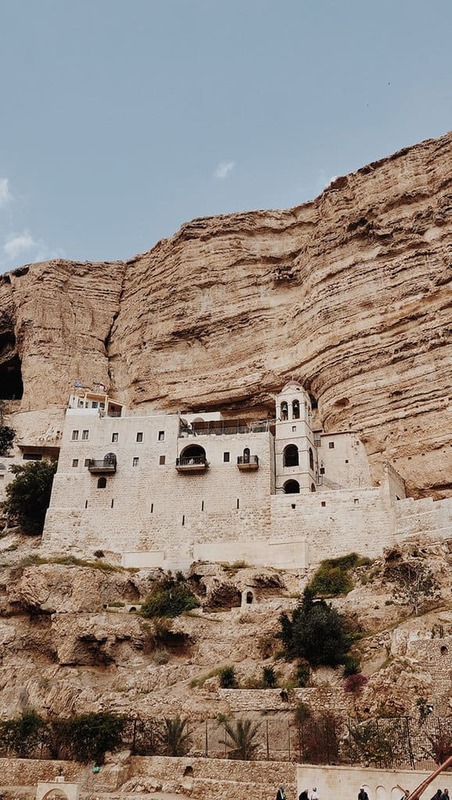 St. George’s Monastery was originally started in the fourth century by a few monks who were looking to immerse themselves in the lifestyles and desert stories of John the Baptist and Jesus. The monks, and perhaps most notably the hermit John of Thebes, eventually settled on the spot around a cave where it is believed the prophet Elijah was fed by ravens. The monastery was destroyed by the Persians and then rebuilt by the Crusaders before falling derelict. It wasn’t until 1878 when a Greek monk, Kalinikos, came to live here that the monastery started to look like its former glorious and cliff-hugging self. Kalinikos finished his renovations in 1901. Today there are still a few Greek Orthodox monks who inhabit the monastery, and who are welcoming of visitors and invited us in to hear all about their monastery and what it is like to live there. The students then traveled to Ein Mebua spring located not far from there. Travelling the road to Ein Mabua Spring is an adventure in its own right as you snake over, below, and around the desert mountains until you finally plunge towards the Ein Mabua parking lot. We were met by a concrete swimming pool which what is officially the Ein Mabua Spring. This pool fills and empties intermittently from underground rain water seeping from the hills of Jerusalem. Some of the students took a beautiful short hike downstream through the large desert gorge. The students ended the afternoon by enjoying a chill BBQ at Debbie’s house with her family and we had a very fun afternoon all together.